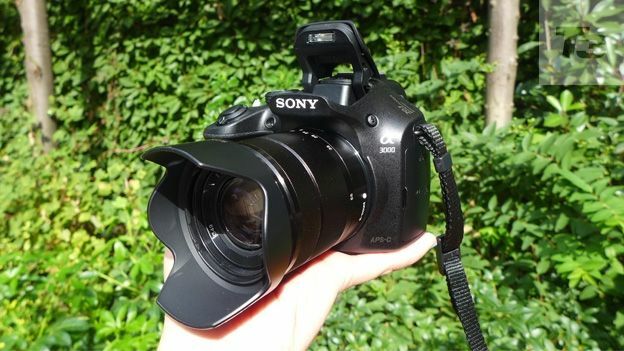 The Sony A3000 is a new entry-level addition to the Alpha range, and is the first in the series to use the the E-Mount lens system from the NEX compact system camera range. Confused? This crossing of the streams between the NEX and Alpha ranges is a tad baffling for shoppers (not to mention, for us). While it's part of the Alpha range (where all the other models are DSLRs) and it looks like a DSLR, the A3000 is actually a compact system camera. As such, it uses the E-Mount lenses that you'll find on Sony's NEX cameras - the Sony NEX-6, Sony NEX-7 and the newly announced Sony NEX-5T - and not the A-Mount lenses that the rest of the Alpha models use. The price tag is certainly low, but it really shows in the build quality. The chassis looks and feels very plasticky, although at least this means that the camera is light. It's cheaper than the entry-level Canon EOS 100D DSLR, but nowhere near as compact, and the rudimentary lineup of controls also reflects the price tag. The A3000 sports a respectable 20.1MP APS-C Exmor sensor and you'll also get 15 arty filters to play with to spruce up your snaps. As we've already mentioned, the A3000 uses the E-Mount system, giving you a total of 18 lenses to choose from. The 3-inch screen is pretty basic, and the 230k dot is not particularly impressive. Images were very grainy and practically invisible in bright sunshine. You also get an electronic viewfinder with a 201,600-dot resolution, but unlike many other CSCs such as the Samsung NX300, it doesn't fire up automatically, which is slightly annoying. As a budget DSLR, the Sony A3000 offers a very good price, although that's clearly reflected in the basic controls, design and build quality. We haven't been able to test out the picture quality in full just yet, but we'll be looking at that more closely in our full review.